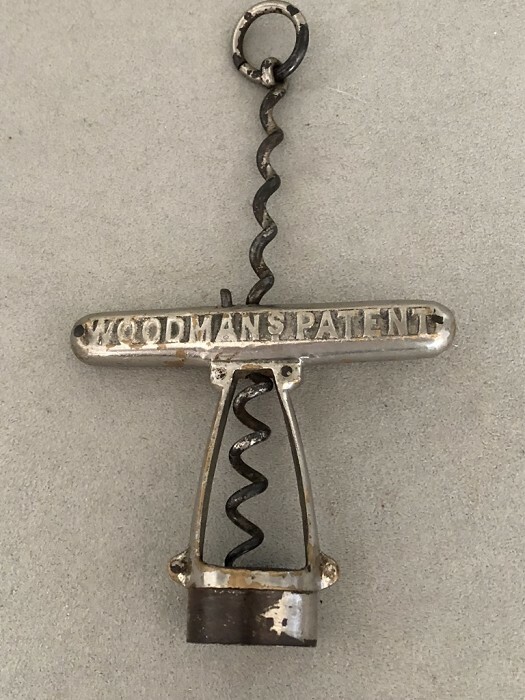 WOODMAN 1886 PATENT CORKSCREWWITH NICKEL PLATED CAST FRAME...A UNIQUE WIRE SHAFR AND TAPERED HELIXCOMBINATION AND RING WHICH LOCKS TO A HOOK ON THE HANDLE. CAST MARKING IN HANDLE "WOODMANs PATENT...PATd JAN.Y 6. 1886"
Operation...Begins with the worm fully extended and ring and wire shaft locked to frame. After insertion frame meets bottle neck and hook is manually released...further clockwise turning causes the wire shaft to rise and pull cork. OVERALL good condition...some loss of plating on barrel and tip of handle and ring holder (see photos).